Do you want to start a business in the Garments Industry of Bangladesh? 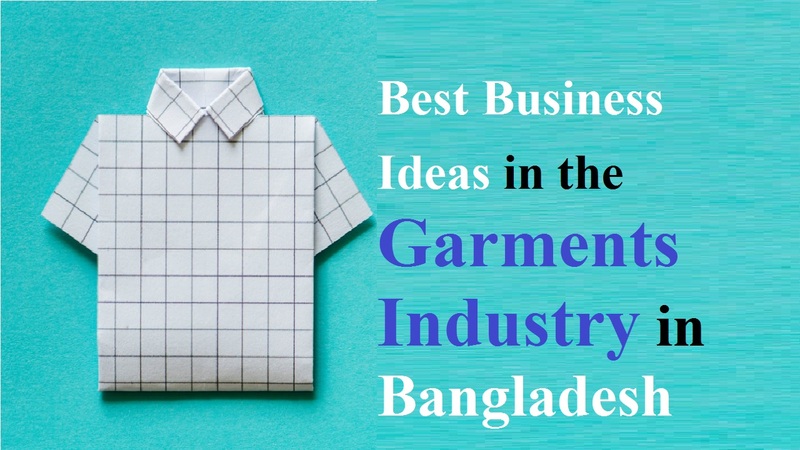 In this article, I’m going to share 5 best business ideas in the Garments Industry in Bangladesh. Those who are having knowledge and experience in the garment and clothing industry are looking for trending and profitable apparel business ideas in setting up their own venture. In fact, the garments industry has seen remarkable changes in the past few years in the global textile industry. It may be either men’s clothing, women’s clothing, kids wear or infant wear, the clothing wholesale supply is increasing worldwide in all the sectors of the industry. And due to the very-low-cost production, Bangladesh continues expanding its Textile Garment Industry. As a result, we can say that sectors like Industrial Clothing and Sports Wear will experience growth with the increasing demand for performance apparel. And fashion clothing will see an upward trend as well. As an overpopulated country, Bangladesh has a good prospect of the best business ideas in the garments sector. Although the economy of Bangladesh is significantly dependent on agriculture, its great news for the country that, readymade garments (RMG) sector of Bangladesh has raised as the biggest earner of foreign currency. This is the sector that not only contributes significantly to the GDP but creates about 4.2 million employment opportunities. As most of the workers are women, the Readymade garments (RMG) of Bangladesh is powered by young, urbanizing, and workers. Also, as a catalyst for the development of Bangladesh, the readymade garments industry acts. While making it a prestigious brand across the globe, the “Made in Bangladesh” tag has also brought glory for the country. Besides, this is the sector that accounts for 81% of the total export earnings of the country. If you’re looking for the best business ideas in the garments industry then Bangladesh is the right choice. This is because Bangladesh is the world’s third largest producer of textiles and garments after India. That’s why the fundamental strength of this industry flows from its strong production base of a wide range of fibers/yarns from natural fibers. Apart from these, the growth pattern of the Bangladesh garment industry in the last decade has been considerably more than the previous decades. Also, as it’s a profitable and lucrative sector for new and aspiring entrepreneurs, let’s know about the top 5 best business ideas in this industry. You need to set up a garment factory in garment sub-contract manufacturing, which is one of the best business ideas in the garments industry in Bangladesh. While you’re setting up a small factory, you can do sub-contracting work (job-work) for export houses and domestic brands. And in excess quantity than own production capacity, in buying seasons garment export houses book orders. Also, they look for sub-contractors or job-workers to complete those order on time. If you’re in this business then you neither need to handle buyers nor need to purchase raw materials. What you have to is that to collect cuttings from exporters and stitch garments. In addition to these, there are some brands that look for stitching, finishing packing the garments. You just need to invest in machines, later you don’t need to invest in raw materials in the sub-contract manufacturing. It’s a source of the garment from different manufacturers and brands in volume as a garment wholesale business. After that, you can distribute and sell to garment stores. Also, you can use your spare time to start garment wholesale business. It looks like one of the best business ideas that can use your time properly while having an extra income. Also, you’ll have a good margin in this business as you purchase goods in bulk quantity and directly from manufacturing hubs. And there are many places where you can source garment in bulk for your wholesale business. You can get garment manufactured from the job-workers when you get buyers. In garment manufacturing, printing and embroidery are value-added processes. The designer always adds some colors and patches on their designs to make product trendy in this fashion age. That’s why printing and embroidery unit can be one of the best business ideas in the garments industry in Bangladesh. But, you need to invest extra money for these machines to set up Print and Embroidery machines in-house garment manufacturing factories. Also, you should hire staff for your business and need to bear the maintenance costs as well. If you can fill up the gap and printing business then you can start with flat-bed screen printing. As the digital textile printers getting more popularity, you can even setup printing business using a digital textile printer. This way you can do custom garment print services for your clients. As an intermediator between the apparel brands and apparel manufacturers, an apparel buying agency works. After taking orders from buyers, you have to get the garment manufacturing done in a garment manufacturing. Also, you need to follow any definite rule while finding a garment supplier. When small retailers give all responsibilities of vendor selection and order sourcing to their sourcing agents, bigger brands involved their team in vendor selection. So, you might have developed a good relationship with your buyers if you’re working as a merchandiser in an export a house or buying a house for a few years. At the start of this decade, the custom t-shirt printing business got popularity. Individual customers or a group of customers, design their own design and place t-shirt/polo shirt order online in custom print business. Thus they get the printed t-shirt delivered at their home. Although this business opportunity is still there, it has saturated. As there are big players, you have to find the gap and fill by your innovative services. You have to buy blank T-Shirts and print the selected garment when you’ll get an order with printing artwork. In this case, you can use a digital garment printer or a screen printer to print them.